A bulletproof coffee is a cup of black coffee blended with MCT oil and a pat of butter. Some people swear by it as a replacement for breakfast. Some believe it promotes mental acuity. I’m not a dietician or a scientist, so whatever you think it does for you is your business. But as someone who’s been roasting coffee longer than he’s been shaving, I cannot recommend this drink. 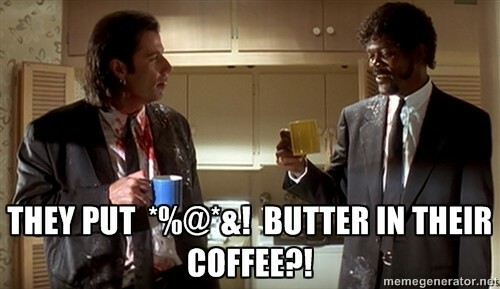 As much as I enjoy a splash of cream in my second cup of the day and even the occasional big-chain, coffee-flavored milkshake, adding butter to coffee is a bridge too far for me. When you’re as serious about good coffee as we at Equator are, you don’t use it as a mere substrate (I wouldn’t drink a hundred year-old cognac with a bunch of Flintstone Vitamins thrown into it either). However, if you INSIST upon making this monstrosity, maybe you can minimize the damage by using a softer coffee that already has slight notes of butter, like Organic Mexico, rather than a bright coffee (Ethiopia, Tanzania). To me, the better solution seems to be to throw all those non-java ingredients into a blender with a half-cup of warm water and a few spinach leaves and then shoot it back in one gulp. You enjoy the supposed health benefits of the trend without compromising your delicious cup of coffee which, at only five calories per cup, already seems like a pretty healthy morning option on its own. We’re interested to hear what you think about this trend. Are we missing something? Is there a more palatable way to make it? Is it even healthy to begin with, or just another excuse for people to shove butter into their faces? Let us know in the comments section. Thanks! KEURIG REVIEW: GOOD INTENTIONS. HORRIBLE COFFEE.